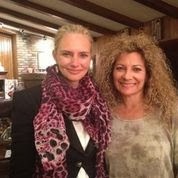 Karinna, an internationally recognized relationship expert and founder of Sacred Love, Inc. (http://www.sacredlove.com) treated us to an intimate, thoughtful, warm and illuminating evening the other night. She led us through thinking about, first of all, not only what the word foreplay means to us, both from a sexual standpoint and from a broader one, i.e. the little signals partners of a couple give each other to reveal wanting intimacy of any kind, sexual or otherwise; and then on what the word “play” means to each of us, and we all considered and addressed various kinds and aspects of how play manifests for each of us in our relationships; and on how, when, why and where we signal to our partners that we’re in “no play” mode. It was fascinating and quite enjoyable to contemplate and talk through a part of our lives that gets played out quite often (or not, as the case may be) but is not necessarily thought about in much depth. There was a lot of mention of the importance of being in the moment, and consciously reaching out and being loving to our partners in a variety of ways. Each of us learned something about the ways in which we relate to our partners and came away with lots of food for thought about ways to empower ourselves to affect change for the better in that arena. -Professional Women in relationships from 30-50+ who want to enhance their current relationship. Each interview takes about 30 minutes face to face and will include various questions about specific challenges that women who fall within these categories are dealing with. Karinna is looking for 10+ women in each category and the interviews will be taking place in February. If interested please email info@sacredlove.com and write “Feb Interview” in the subject line.